VIRAL NOW: 'Laglag Barya Gang' Caught on Cam! This is in the awareness of everyone, especially for those who are using public transportation. The video will show you the scene how fast the thieves can victim you in just a couple of minutes. The modus-operandi is also known as "Laglag Barya Gang". These are the group of men usually three to five members and targeting those passengers of the jeepney. 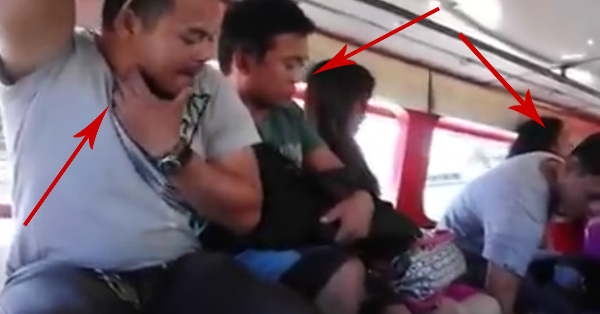 In the video, there are three members who steal the wallet of a young lady, The first suspect was sitting in front of the victim and the others are seated next to the victim. One of them will pretend that the coins fell on the floor, so he will pick it up one by one while on the other side the other suspect is already getting the things inside the bag. It is their way to let the victim focus the attention to the one who is picking the coins. There is also a part of this video that has a slow motion to watch how clear and fast they got the young lady's wallet. Everyone is advised to give extra care with their things and be alert all the time. Hope this video will help.